Basic Features - Ideal Extensions for Joomla! Form Fields allows you to extend the functionality of Contact Enhanced. Read more information regarding the Form Fields in the Documentation Page. Select Components → Contact Enhanced → Form Fields from the drop-down menu of the Joomla! Administrator Panel. To add a new Form Field, press the "New" icon in the toolbar. To edit an existing Form Field, click on the Form Field's Name OR click the Form Field's checkbox and then click on the "Edit" icon in the toolbar. AutoComplete: For Advanced users: AutoCompleter is a custom field which uses MooTools to provide the functionality for text suggestion and completion. You will need to provide a SQL query in order to allow the user to search the database using this Custom Field. Multiple Files: Allow users to upload any file type or size using the form. File type and size can be restricted in the Multiple Files Parameters. If you have configured Contact Enhanced to save the messages in the Component Configuration, it will save the files in [path to Joomla]/administrator/components/com_contactenhanced/uploadedfiles/ and also send as attachments, otherwise it will only send the files as attachments. If all files together are larger than 2Mb, then CE will save the file and only send a link to the files by email. This is because some mail servers do not allow messages larger than 2Mb. Ordering: Field Ordering; The order in which to display Custom Fields. In the Custom Fields Manager, if the list is sorted by this column, you can change the order by clicking the arrows or by entering the sequential order and clicking the 'Save Order' icon. 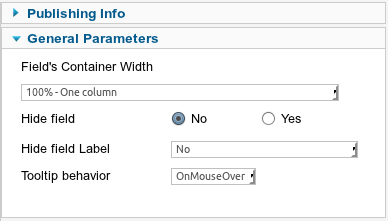 Field's Container Width: Allows you to display the Custom Fields in multiple columns, by changing the Custom Field's container width; The label and field of a Custom Field are inside a <div> tag which is called "container" here. Keep in mind that Custom Field order will be from left to right -> top to bottom.